The third Hulk Visionaries: Peter David volume is the first to focus solely on the Las Vegas period; when the gray Hulk first became known as Joe Fixit. Incredible Hulk #345, collected in the preceding Hulk Visionaries: Peter David volume, ended with the gray Hulk caught at ground zero of a gamma bomb blast courtesy of the Leader. While the world believed him dead, the Hulk surfaced in Incredible Hulk #347 in Las Vegas, apparently working as a leg-breaker/bodyguard for casino owner Michael Berengetti. He also seemed to have figured out a way to stop himself from turning back into Bruce Banner. In this third volume we find out exactly how the Hulk survived the gamma blast, how he put the cork in Banner, and witness the fallout when Banner eventually resurfaces. 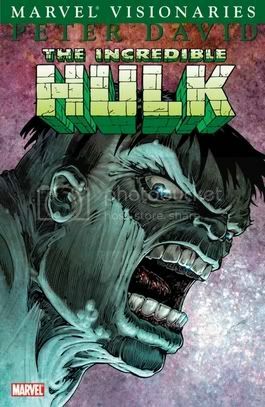 The Vegas stories were popular and remain etched in readers’ memories, evidenced by the fact that – following Paul Jenkins’s example – most readers refer to the gray Hulk simply as “Fixit” these days. I collected these issues as they were released; in fact one of the two letters I’ve had printed in Incredible Hulk was one complaining about the first Hulk issue collected in this volume. Still, I think my tastes veer sharply from those of a lot of my fellow Hulk fans. I didn’t hate Hulk’s time in Vegas, but I didn’t like it much either. The very idea of it rubbed me the wrong way. The moral implications didn’t bother me. If you’d followed David’s gray Hulk adventures this far, you were used to some serious moral flexibility. It just seemed silly. The Hulk has fought gods and giant monsters and now he was a thug in Vegas? He’d laid cities to waste and now he was a glorified bouncer? I’m not saying it didn’t make sense. In many ways it fit the gray Hulk’s character perfectly. In fact, in my review of the preceding volume I wrote that one of the things that helped distinguish David's various interpretations of the Hulk was the notion – a notion that shouldn’t have been as innovative as it was – that the Hulk wanted to build and maintain a life of his own. The Hulk’s recruitment as a leg-breaker is a natural extension of that. It makes perfect sense that the gray Hulk would want to hide from his past and build a new life to enjoy. But as a kid reading my favorite hero’s comic, it pissed me off. It felt demeaning; like Batman becoming a traffic cop. I went back and forth on whether or not I liked Jeff Purves’s art. Purves was Incredible Hulk’s penciler for the entire Las Vegas period and as far as I can tell, save for a few Hulk shorts he drew for Marvel Comics Presents, that was the extent of his time in comics (according to IMDB however he’s been working in movies and TV, e.g. Mulan and The Simpsons Movie). There was a bland, featureless quality to most of his faces. In the case of the Hulk himself, his face alternated between looking like that of a bulldog, an old man, or a massive turtle (or at least that’s what it made me think of – there are a few panels that always remind me of that giant turtle thing the hero talks to in The Neverending Story). At the same time, he did a lot of interesting, dynamic things with perspective – particularly during action scenes – that I really liked. I don’t know his reasons for not continuing with comics, but I’m curious what he would have produced if he’d worked on other titles. This volume opens with Web of Spider-Man #44. During a book tour stop in Vegas, Spider-Man gets caught in the crossfire between a quartet of cyborg commandos calling themselves Warzone. When one of them injures the Hulk’s girlfriend Marlo, the gray guy gets involved, which leads into Incredible Hulk #349. Hulk fights Spidey, Spidey fights Warzone, Hulk fights Warzone, Warzone fights Warzone, and when everything’s resolved Hulk goes home to find Doctor Doom waiting for him in his apartment. That leads into Fantastic Four #320 when Doom convinces the Hulk to travel to New York City to fight the Thing for no real reason. They continue their fight in Incredible Hulk #350 and that issue ends with the Beast stopping the Hulk before he can leave NYC and blackmailing him into helping the Avengers in one of (and, if memory serves, the very first of) Marvel’s huge, dumb annuals crossovers. Thankfully, they didn’t bother reprinting Avengers Annual #17 (which ends with the Hulk betraying the other heroes and getting blasted through the ocean by the High Evolutionary and landing, very conveniently, in the Nevada desert). I know crossover stories happen, and occasionally they can be very fun, but at the time I remember having three Hulk crossover issues in a row - particularly when neither of the three issues had anything to do with one another - was a little extreme. Thankfully, David wrote the Web of Spider-Man issue, but Englehart’s Fantastic Four issue really didn’t make much sense to me (and yes, for reasons other than Hulk getting beat up by Thing). Walter Simonson wrote the Avengers annual and it wasn’t particularly bad, but the Hulk didn’t really seem to have a reason to be in the story other than to sell a few extra comics. These days Marvel seems to have gone more crossover crazy than ever, but back then this seemed a little excessive. Unfortunately, I have to admit the only part of this volume I really enjoy are “Total Recall” and “Fervor” – Incredible Hulk #s 351 & 352 respectively – which tell the tale of how Hulk survived the gamma bomb blast and how he (all too temporarily) suppressed the change back to Banner. We learn that wizards on K’ai, the homeworld of the Hulk’s late lover Jarella, had been monitoring the Hulk’s activities on Earth. When they saw the Hulk was about to be killed by the Leader, they teleported him to K’ai. They tell the Hulk that during his absence a Hulk-worshipping religion has emerged with a particularly vicious zealot at its head. It had been a long time since the Hulk had gone on any kind of crazy alien/cosmic/interdimensional adventures, and getting a new world-hopping Hulk tale was refreshing. I even liked Purves’s art better in handling the otherworldliness of K’ai as opposed to the more real-world Las Vegas. Re-reading these stories for the review has strengthened an opinion that has been percolating with me for a while – that the Hulk is his best when he’s off Earth and that his adventures should take him the hell away from Earth as much as possible. For an admirer of Peter David’s Incredible Hulk, the collection is essential and as such a fan I wouldn’t want to be without it. It just wasn’t my favorite time in the green-sometimes-gray goliath’s history.